Download "Analytical goal setting in aneuploidy screening: within person biological variability of first trimester biochemical markers"
5 128 K. Spencer and N. J. Cowans Figure 4 Influence of analytical precision on confidence interval of risk. Free b-hcg= 2.50 MoM; PAPP-A 0.55 MoM; nuchal translucency 2.2 mm; crown rump length 55 mm; age 24 years. (1) Marker CV 2% 2.5%, (2) marker CV 1% 1.5%, (3) marker CV 4% 5%, (4) marker CV 6% 7%. Adapted from Spencer 27 this scheme is summarised in the 2010 Annual Report. 28 Of the four major systems used for first trimester biochemical screening, the within method between laboratory CV% (which is a worst case scenario) is around 4% for both markers for the Brahms Kryptor and the Roche platforms, slightly higher at 6% for the PerkinElmer platforms and around 8% for the Siemens Immulite platforms. 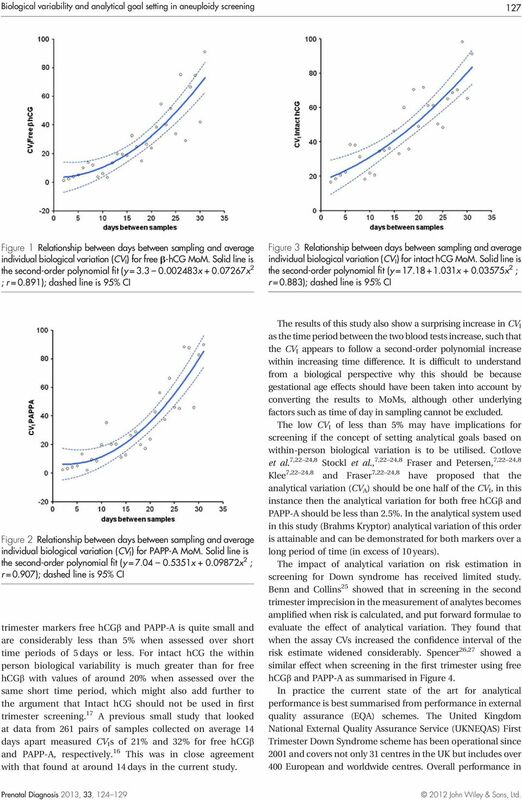 On the basis of our data on biological variability, analytical performance below 5% is required to minimize increased variability in the confidence interval of the risk. This fits with our previous simulations on the impact of different levels of imprecision performance on risk estimates. Expert groups such as the Fetal Medicine Foundation 29 have also advised that analytical performance between day in screening laboratories should be less than 3.5%. Clearly such advice fits with the now established biological variation of the first trimester biochemical markers and has a sound scientific basis. 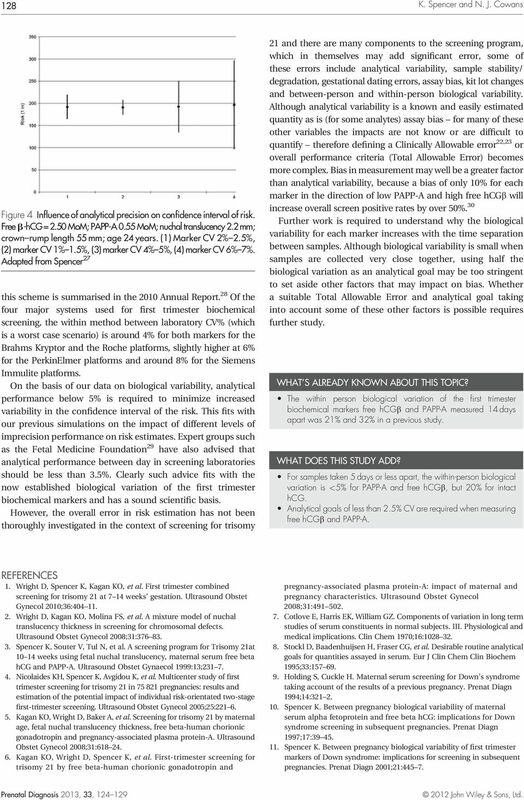 However, the overall error in risk estimation has not been thoroughly investigated in the context of screening for trisomy 21 and there are many components to the screening program, which in themselves may add significant error, some of these errors include analytical variability, sample stability/ degradation, gestational dating errors, assay bias, kit lot changes and between-person and within-person biological variability. Although analytical variability is a known and easily estimated quantity as is (for some analytes) assay bias for many of these other variables the impacts are not know or are difficult to quantify therefore defining a Clinically Allowable error 22,23 or overall performance criteria (Total Allowable Error) becomes more complex. Bias in measurement may well be a greater factor than analytical variability, because a bias of only 10% for each marker in the direction of low PAPP-A and high free hcgb will increase overall screen positive rates by over 50%. 30 Further work is required to understand why the biological variability for each marker increases with the time separation between samples. Although biological variability is small when samples are collected very close together, using half the biological variation as an analytical goal may be too stringent to set aside other factors that may impact on bias. Whether a suitable Total Allowable Error and analytical goal taking into account some of these other factors is possible requires further study. WHAT S ALREADY KNOWN ABOUT THIS TOPIC? The within person biological variation of the first trimester biochemical markers free hcgb and PAPP-A measured 14 days apart was 21% and 32% in a previous study. WHAT DOES THIS STUDY ADD? 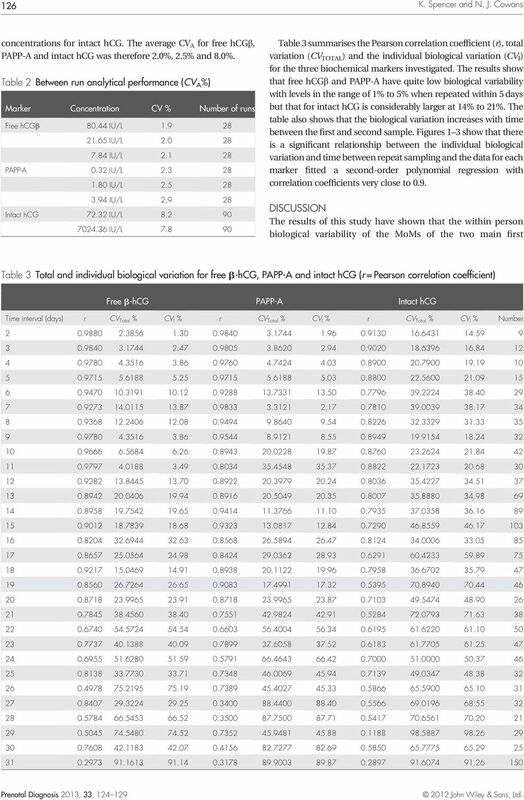 For samples taken 5 days or less apart, the within-person biological variation is <5% for PAPP-A and free hcgb, but 20% for intact hcg. Analytical goals of less than 2.5% CV are required when measuring free hcgb and PAPP-A. REFERENCES 1. Wright D, Spencer K, Kagan KO, et al. First trimester combined screening for trisomy 21 at 7 14 weeks gestation. Ultrasound Obstet Gynecol 2010;36: Wright D, Kagan KO, Molina FS, et al. A mixture model of nuchal translucency thickness in screening for chromosomal defects. Ultrasound Obstet Gynecol 2008;31: Spencer K, Souter V, Tul N, et al. A screening program for Trisomy 21at weeks using fetal nuchal translucency, maternal serum free beta hcg and PAPP-A. Ultrasound Obstet Gynaecol 1999:13; Nicolaides KH, Spencer K, Avgidou K, et al. Multicenter study of first trimester screening for trisomy 21 in pregnancies: results and estimation of the potential impact of individual risk-orientated two-stage first-trimester screening. Ultrasound Obstet Gynecol 2005;25: Kagan KO, Wright D, Baker A, et al. Screening for trisomy 21 by maternal age, fetal nuchal translucency thickness, free beta-human chorionic gonadotropin and pregnancy-associated plasma protein-a. Ultrasound Obstet Gynecol 2008;31: Kagan KO, Wright D, Spencer K, et al. First-trimester screening for trisomy21byfreebeta-humanchorionicgonadotropinand pregnancy-associated plasma protein-a: impact of maternal and pregnancy characteristics. Ultrasound Obstet Gynecol 2008;31: Cotlove E, Harris EK, William GZ. Components of variation in long term studies of serum constituents in normal subjects. III. Physiological and medical implications. Clin Chem 1970;16: Stockl D, Baadenhuijsen H, Fraser CG, et al. Desirable routine analytical goals for quantities assayed in serum. Eur J Clin Chem Clin Biochem 1995;33: Holding S, Cuckle H. Maternal serum screening for Down s syndrome taking account of the results of a previous pregnancy. 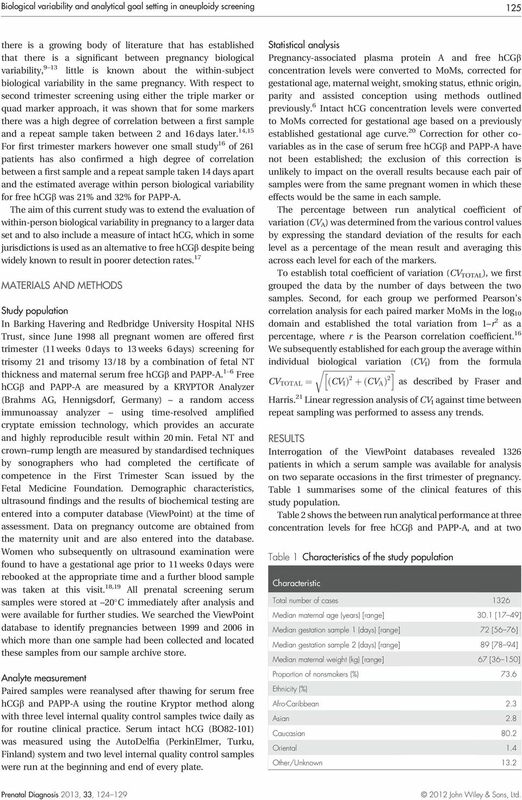 Prenat Diagn 1994;14: Spencer K. Between pregnancy biological variability of maternal serum alpha fetoprotein and free beta hcg: implications for Down syndrome screening in subsequent pregnancies. Prenat Diagn 1997;17: Spencer K. Between pregnancy biological variability of first trimester markers of Down syndrome: implications for screening in subsequent pregnancies. Prenat Diagn 2001;21:445 7. GUIDELINES FOR THE VALIDATION OF ANALYTICAL METHODS FOR ACTIVE CONSTITUENT, AGRICULTURAL AND VETERINARY CHEMICAL PRODUCTS. CONGENITAL HEART DISEASE Introduction Congenital heart disease (CHD) is the most common congenital disorder in newborns . Due to definitional issues, there are large variations in prevalence estimates. Standard Comparison Protocols at NICU, Regional and National levels. ANNEX 5.- Deliverable 5: Standard Comparison Protocols 2006 Standard Comparison Protocols at NICU, Regional and National levels. 1 ) Data Entry: Before data is analysed, a quality control protocol is performed. SCDI White Paper No. 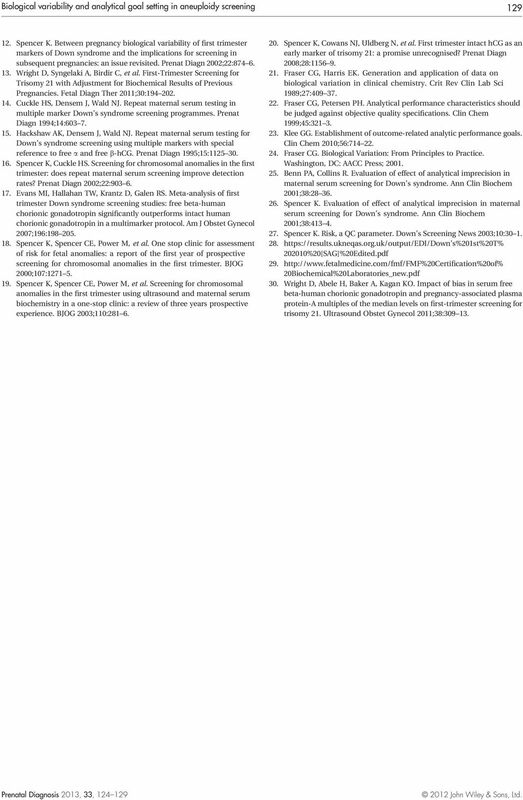 1074 Approved by ADA Council on Dental Practice May 2013 ADA SCDI White Paper No. 1074 Electronic Oral Health Risk Assessment Tools 2013 Copyright 2013 American Dental Association. Lothian Guidance for Diagnosis and Management of Thyroid Dysfunction in Pregnancy. What Does Having a FDA Cleared Pregnancy Test Mean?